Thanks to the powerful new high-contrast camera installed at the Very Large Telescope, photos have been obtained of a low-mass companion very close to a star. 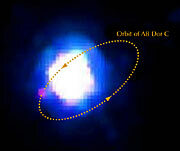 This has allowed astronomers to measure directly the mass of a young, very low mass object for the first time. The object, more than 100 times fainter than its host star, is still 93 times as massive as Jupiter. And it appears to be almost twice as heavy as theory predicts it to be. This discovery therefore suggests that, due to errors in the models, astronomers may have overestimated the number of young "brown dwarfs" and "free floating" extrasolar planets. A star can be characterised by many parameters. But one is of uttermost importance: its mass. It is the mass of a star that will decide its fate. It is thus no surprise that astronomers are keen to obtain a precise measure of this parameter. This is however not an easy task, especially for the least massive ones, those at the border between stars and brown dwarf objects. Brown dwarfs, or "failed stars", are objects which are up to 75 times more massive than Jupiter, too small for major nuclear fusion processes to have ignited in its interior. To determine the mass of a star, astronomers generally look at the motion of stars in a binary system. And then apply the same method that allows determining the mass of the Earth, knowing the distance of the Moon and the time it takes for its satellite to complete one full orbit (the so-called "Kepler's Third Law"). In the same way, they have also measured the mass of the Sun by knowing the Earth-Sun distance and the time - one year - it takes our planet to make a tour around the Sun. The problem with low-mass objects is that they are very faint and will often be hidden in the glare of the brighter star they orbit, also when viewed in large telescopes. Astronomers have however found ways to overcome this difficulty. For this, they rely on a combination of a well-considered observational strategy with state-of-the-art instruments. First, astronomers searching for very low mass objects look at young nearby stars because low-mass companion objects will be brightest while they are young, before they contract and cool off. 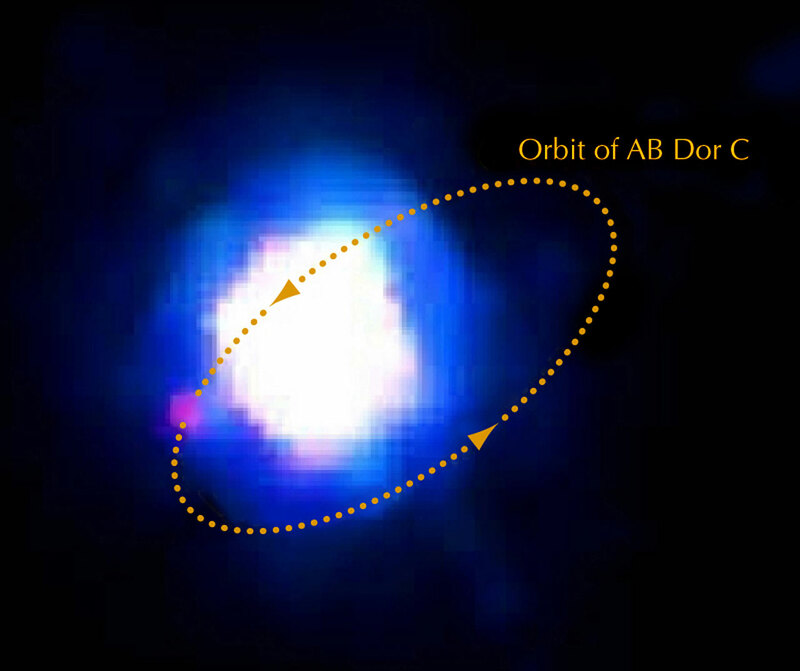 In this particular case, an international team of astronomers  led by Laird Close (Steward Observatory, University of Arizona), studied the star AB Doradus A (AB Dor A). This star is located about 48 light-years away and is "only" 50 million years old. Because the position in the sky of AB Dor A "wobbles", due to the gravitational pull of a star-like object, it was believed since the early 1990s that AB Dor A must have a low-mass companion. To photograph this companion and obtain a comprehensive set of data about it, Close and his colleagues used a novel instrument on the European Southern Observatory's Very Large Telescope. This new high-contrast adaptive optics camera, the NACO Simultaneous Differential Imager, or NACO SDI , was specifically developed by Laird Close and Rainer Lenzen (Max-Planck-Institute for Astronomy in Heidelberg, Germany) for hunting extrasolar planets. The SDI camera enhances the ability of the VLT and its adaptive optics system to detect faint companions that would normally be lost in the glare of the primary star. Turning this camera towards AB Dor A in February 2004, they were able for the first time to image a companion so faint - 120 times fainter than its star - and so near its star. Says Markus Hartung (ESO), member of the team: "This world premiere was only possible because of the unique capabilities of the NACO SDI instrument on the VLT. In fact, the Hubble Space Telescope tried but failed to detect the companion, as it was too faint and too close to the glare of the primary star." The tiny distance between the star and the faint companion (0.156 arcsec) is the same as the width of a one Euro coin (2.3 cm) when seen 20 km away. The companion, called AB Dor C, was seen at a distance of 2.3 times the mean distance between the Earth and the Sun. It completes a cycle around its host star in 11.75 years on a rather eccentric orbit. Using the companion's exact location, along with the star's known 'wobble', the astronomers could then accurately determine the companion's mass. The object, more than 100 times fainter than its close primary star, has one tenth of the mass of its host star, i.e., it is 93 times more massive than Jupiter. It is thus slightly above the brown dwarf limit. Using NACO on the VLT, the astronomers further observed AB Dor C at near infrared wavelengths to measure its temperature and luminosity. "We were surprised to find that the companion was 400 degrees (Celsius) cooler and 2.5 times fainter than the most recent models predict for an object of this mass," Close said. "Theory predicts that this low-mass, cool object would be about 50 Jupiter masses. But theory is incorrect: this object is indeed between 88 to 98 Jupiter masses." These new findings therefore challenge current ideas about the brown dwarf population and the possible existence of widely publicized "free-floating" extrasolar planets. Indeed, if young objects hitherto identified as brown dwarfs are twice as massive as was thought, many must rather be low-mass stars. And objects recently identified as "free-floating" planets are in turn likely to be low-mass brown dwarfs. For Close and his colleagues, "this discovery will force astronomers to rethink what masses of the smallest objects produced in nature really are." : The team is composed of Laird M. Close, Eric Nielsen, Eric E. Mamajek and Beth Biller (Steward Observatory, University of Arizona, Tucson, USA), Rainer Lenzen and Wolfgang Brandner (Max-Planck Institut for Astronomie, Heidelberg, Germany), Jose C. Guirado (University of Valencia, Spain), and Markus Hartung and Chris Lidman (ESO-Chile). : The NACO SDI camera is a unique type of camera using adaptive optics, which removes the blurring effects of Earth's atmosphere to produce extremely sharp images. SDI splits light from a single star into four identical images, then passes the resulting beams through four slightly different (methane-sensitive) filters. When the filtered light beams hit the camera's detector array, astronomers can subtract the images so the bright star disappears, revealing a fainter, cooler object otherwise hidden in the star's scattered light halo ("glare"). Unique images of Saturn's satellite Titan obtained earlier with NACO SDI were published in eso0412. The work presented here appears as a Letter in the January 20 issue of Nature ("A dynamical calibration of the mass-luminosity relation at very low stellar masses and young ages" by L. Close et al. ).